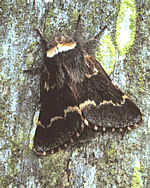 Occurs in woodland and parkland from mid October into early December. 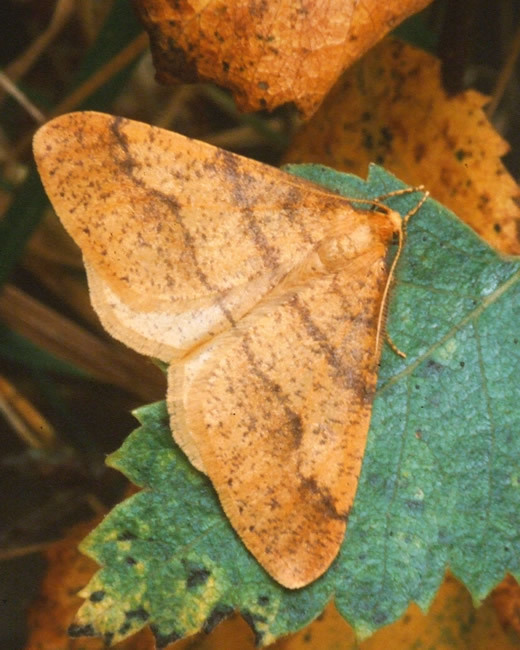 Despite its name, the December Moth rarely lasts into that month in our area. Unusually for moths that are out in winter, both sexes fly. They often come to lighted windows. 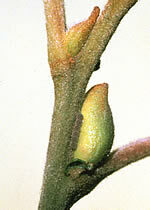 May be found in woodland and gardens in November and December. Small, pale moths fluttering slowly in car headlights on a still winter's evening are probably males of this species, the female being flightless. 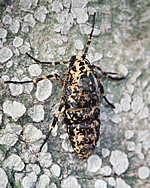 Look for this species in birch or beech woodland, in late October and November. This is a slightly larger, paler and greyer version of the previous species, best distinguished by its more elongated wings. Despite its English name, its distribution is not particulary northern. 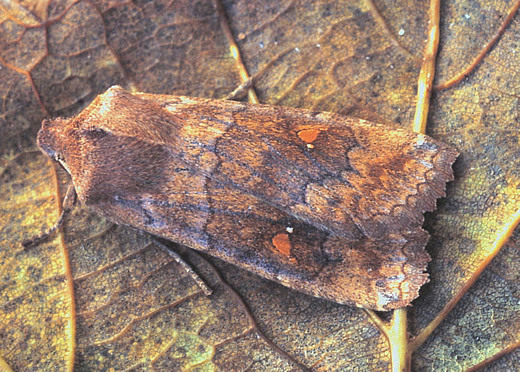 Occurs in late October through November in woodland. Again, its English name is misleading as this is quite a common moth, especially in birchwoods. Like others in its group, the female is flightless. 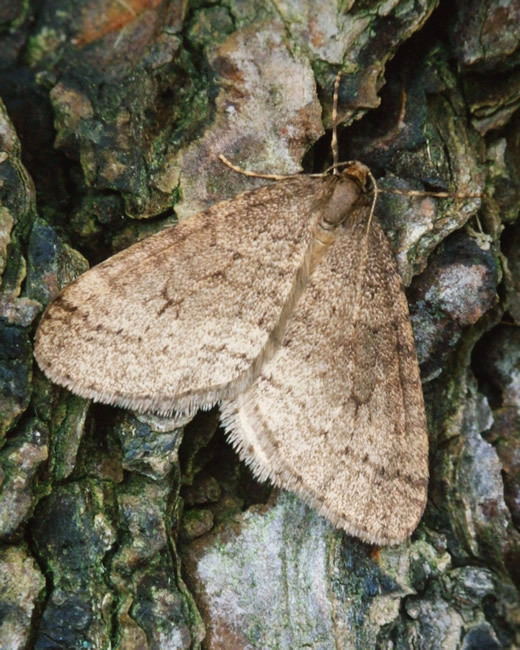 This moth may be found in woodland from late October (sometimes earlier) into New Year. Males are very variable, some strikingly marked like the one illustrated, others plain and dull. The female (lower image) is virtually wingless, and rarely seen. The Satellite probably gets its name not from the lunar crescent on its forewing but from the detached dots at either end, often of a different colour as in this case. 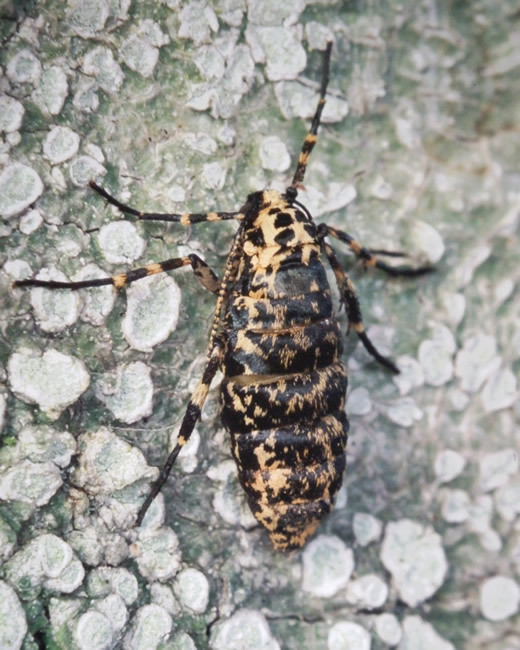 It does not truly hibernate, but becomes active on mild nights even in the depths of winter, feeding on the juices of any fermenting berries still left on trees and bushes. 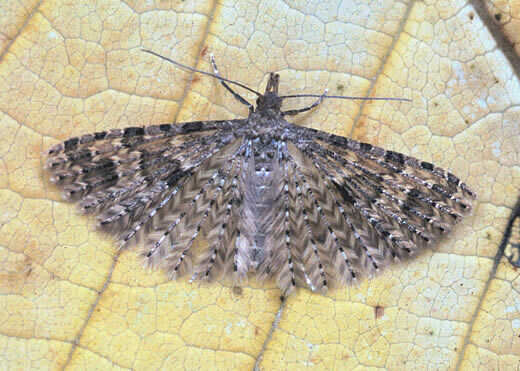 Uniquely among British species, the wings of this moth are each made up of six 'feathers'. Despite its delicate appearance it is very long-lived, often entering conservatories or outbuildings to hibernate, though it may bcome active on mild winter days. 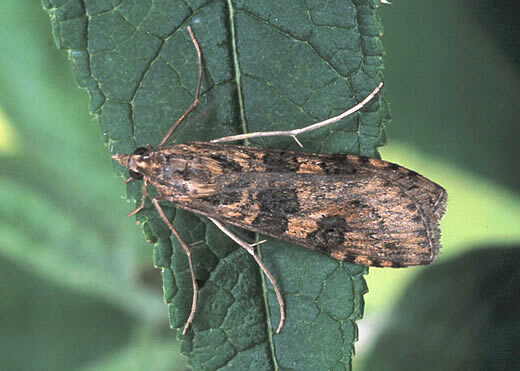 Migrant, commonest in late autumn. 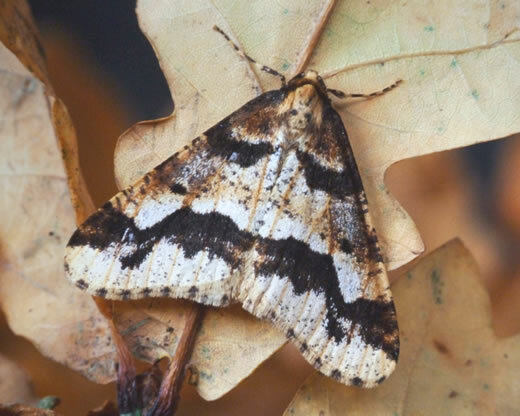 Although fewer of our resident moths are on the wing, late autumn can be surprisingly good for migrants if the winds are from the south. 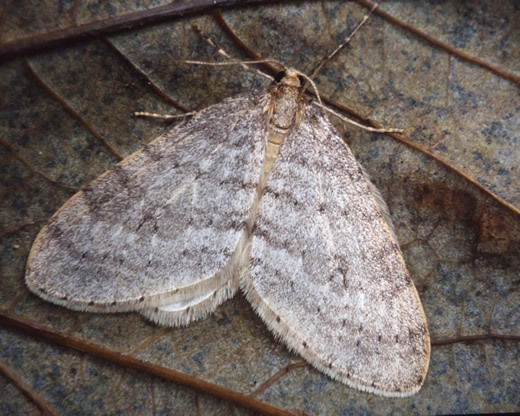 This distinctively long and narrow pyralid reaches northern Scotland annually and may be seen as late as November, sometimes in the daytime. Egg stage: September to April. When eggs must survive for seven or eight months it is worth choosing the oviposition site carefully. This neat row of tiny eggs has been laid in the crevice between the bark and a plump bud that will produce a sallow catkin - nutritious food for the caterpillars when they hatch in spring. Several other identical rows were found on the same branch. 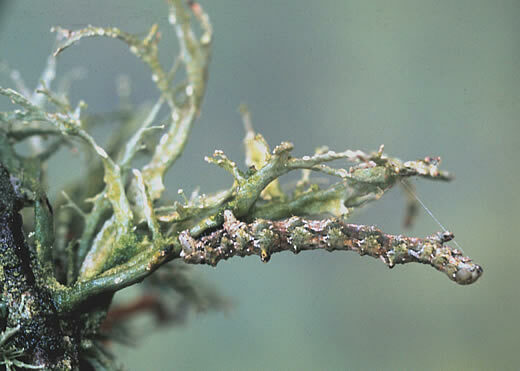 Though associated with trees, this species feeds on the lichens growing on their trunks and branches rather than their leaves. Thus it is able to feed slowly throughout the winter, perfectly camouflaged by its shape and colour and presumably able to tolerate freezing temperatures.